DOJO Creative is a proud sponsor the 15th Annual Kamm Island Fest. This solidifies the partnership between Mishawaka Business Association and DOJO Creative. DOJO Creative believes in strong community partnerships and supporting the area. DOJO Creative recently joined Mishawaka Business Association and looks forward to a strong relationship and supporting businesses and members with providing marketing, high end design and great customer service. 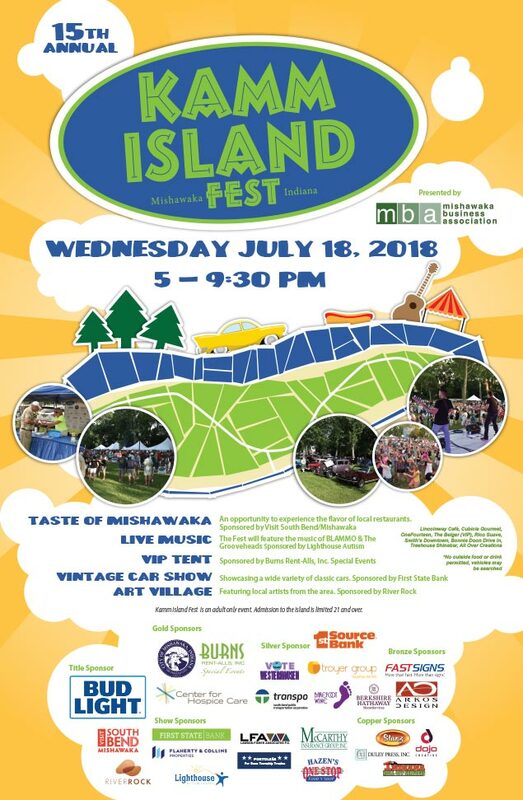 Kamm Island Fest 2018 will take place Wednesday July 18 from 5 to 9:30 at Kamm Island Park in downtown Mishawaka. Live music will be performed by Blammo and The Grooveheads. The festival will also featuring vintage car show, art village featuring local artists and the taste of Mishawaka featuring the city’s best restaurants. This should be a great time and a good excuse to come out and party on a Wednesday.